Elephant Watcher: What's Next for Elephant Watcher? 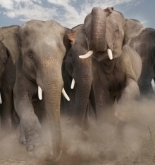 Over the course of the past year, Elephant Watcher has reported on and analyzed the 2012 Republican presidential primary. Now that the primary is effectively over, what's next? During the next few months, we will transition into coverage of the general election in the 2012 presidential race. Analysis of the race will be done in the same manner that proved to be so effective during the Republican primary. The main pages of the website (Candidate Rankings, Primaries, etc.) will be replaced with equivalent versions for the general election, but the Republican primary versions will be archived so that they may still be viewed. In the meantime, the Primaries page will be updated as the state contests continue to be conducted, and news articles will be posted regarding these contests as needed. But Elephant Watcher will also begin a series of articles reviewing the Republican primary from a historical perspective to see what lessons can be gleaned from the way the process played out. Just as the 2004 and 2008 primary seasons did, the 2012 Republican primary will produce useful information for politicians and political observers engaged in the next primary season.